Chris Derrick wins Great Edinburgh XC with teammate Jake Riley in 2nd. 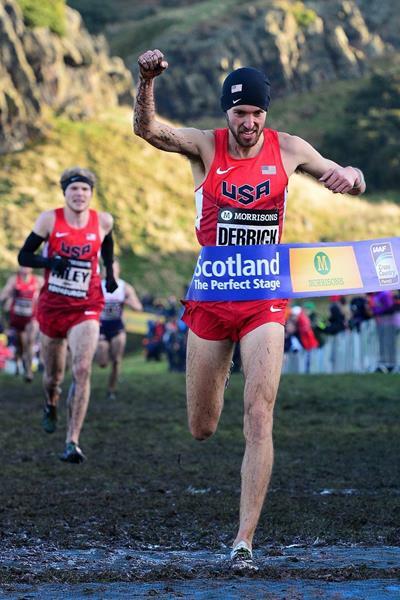 Excellent BBC coverage of yesterday’s Great Edinburgh Cross Country featuring repeat wins by Americans Garrett Heath in the 4km and Chris Derrick in the 8km, along with American men’s 8km, women’s 6km, and two junior races in the team-scored competition. And thanks to USATF.TV for streaming the coverage to U.S. fans over the internet. Losing fans by having coverage? Sounds counter-intuitive, doesn’t it? 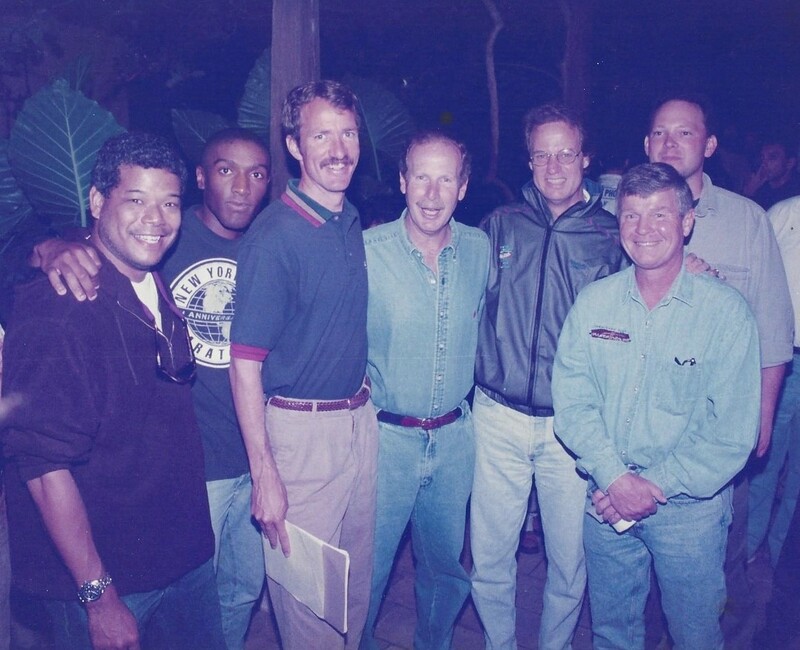 But Dale, who has been shooting races since the mid-1980s went on to clarify his position. Besides NXN, Dale still shoots the New York City Marathon and Ironman Triathlon in Kona, Hawaii. He and I have been friends since the days of Running & Racing, the Salmini Films produced series that ran 26 weeks a year on ESPN beginning in the mid-1980s. We also traveled the world together for ESPN’s Road Race of the Month, which aired from 1989 to 1998. That isn’t to say internet coverage isn’t important and necessary. Flotrack and RunnerSpace do yeoman service for the sport. And the NYRR has promoted its top events quite well with its own in-house internet programming. But without a wider distribution channel, the sport will slowly continue to see an erosion in whatever base set of fans it now has as fewer and fewer new eyeballs run across performances like we saw yesterday in Edinburgh. up close and personal segments destroy the tv show. in longer races unless a big name american is in the race, all you see if the finish line. i watch all my athletics via the web with usually british announcers. i hope web coverage expands. It would certainly help if 3 things also occurred on broadcasts. 1- Treat it like a sport, not some sappy soap opera that is dumbed down to the lowest common denominator. 2- Talk about more than 1-2 stars per event and make sure you’re talking about the actual events, not what you think will happen. 3- Show all the events in some fashion and without belittling the athletes who compete in those events. You cannot grow interest and create stars if you don’t cover the events they’re in. Networks love the coverage of popular athletes (usually a sprinter) complete with their back story and video taking time a way from coverage of actual events. Then the athlete looses followed by an interview at the cost of actual events, and four to five replays. Then the 800 meter starts and they go to a commercial, returning in time to see the finish but not the move that broke the race. Coverage of track and field is usually better tape delayed because of down time between events and without too much commentary by people that know very little about events outside their own and the guy with too much eye make up that also does horse racing. Build a better mousetrap and the world comes knocking at your door. Coverage chased off viewers. It takes work to be a serious track fan and most of us give up and go for a run sooner or later! I guess we old-timers remember too much too well. But there is no reason running and track shouldn’t be a network offering more than it is. NBC shows a fair amount of Diamond League meets and indoors, but now that the World Marathon Majors have signed Abbott as a title sponsor and now have a general manager, too, one would hope that a network series TV deal might be on their to-do list. First thing is for Boston to just get away from their made-up Patriot’s Day Monday holiday (when no one is at home around the country). Patriot’s Day is April 19th. In the olde days the marathon would be run on whatever day of the week the 19th fell. A Monday running robs the sport of the full impact a race like Meb’s from last year might generate. Anyway, thanks, as always, for reading and replying. Keep the faith. Toni: Thoughtful post. I have been concerned about this subject for quite some time now as it has been obvious for the last 10-15 years that running has quickly been transitioning over into an “internet coverage sport” in so many respects. As someone who has done some event broadcasting… but certainly not as much as you have for the past 25 years… I share your and your cameraman’s thoughts…and feelings. Bad enough that we got shunted from broadcast network to cable network coverage in the late 80’s/early 90’s….but most sports were doing that back then. Sad part is that Track/Road Racing (forget X-C completely) is now losing most cable network coverage and now it is just cheaper and easier (for both our NGB, events, and fans) to get internet streaming video coverage at low cost or for free. It is cheaper to produce…. and definitely better than no coverage at all….but I agree that we are rapidly losing out on gaining “new fans” as well as the “average sports fan” who might watch us occasionally out of curiosity or boredom. This is an area that the “Godfathers” of our sport needs to study/address or we will rapidly become irrelevant except to a tiny niche audience. People today would not believe that the old “US vs. USSR” Dual T & F Meet back in the 60’s and early 70’s used to get huge Nat’l TV ratings on ABC’s Wide World of Sports…. long before cable or internet came along. Track was still a “major player” in the “other” sports after baseball, basketball, football, hockey, motorsports, and horse racing back then. Part of the reason was national network television coverage…..as well as extensive major newspaper coverage. Sadly, today is much different. Thanks for raising this point for consideration.